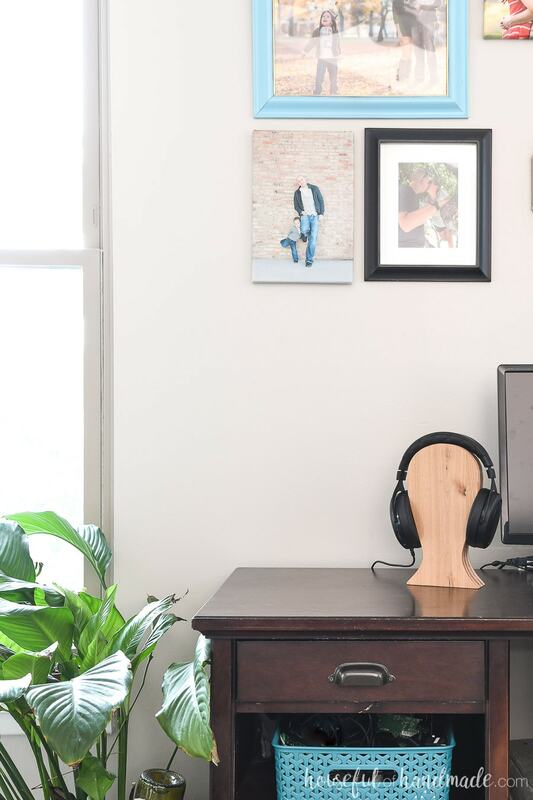 A DIY headphone stand is a wonderful DIY gift for the techie in your life. Trying to do a homemade Christmas can be hard. What do you get the tech guy or teen in your life? Well, I figured it out… with a little help from him! Instead of buying a headphone stand, I made a beautiful DIY headphone stand out of scraps. So this DIY gift for him cost me nothing. Why are some people so hard to find gifts for? Mainly men and teenagers. Probably because they want expensive stuff and I cannot spend hundreds of dollars on a gift each year. And even if I could, I wouldn’t! They don’t need it and they appreciate it much more when they save for it. But seriously, I love to DIY presents for Christmas. However, I really want to give them something they love and will use. So when I was racking my brain to figure out something to make for my husband, I decided to go to the source. And I am so glad I did. You know what he wanted… a headphone stand! I had never even heard of one, maybe because I think headphones are so 1990. I prefer the tiny little earbuds. But he uses his fancy headphones when he plays games or edits videos on the computer. And his last pair was destroyed by the kids because they were knocked on the floor and the cord was cut. Yikes! And what do you know, making a headphone stand is actually really easy. So easy that I almost didn’t want to write a post for it. But then I thought, someone else might need an idea for a hard-to-buy-for man or teenager in their life. And this super easy DIY headphone stand tutorial will be just the thing they are looking for! 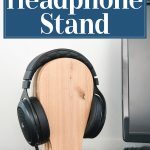 This headphone stand is easy to build, but does require time. Mostly time for the glue to dry, and then time for the finish to dry. So make sure to give yourself a few days to make it. But you can get this fun headphone holder ready in a weekend so go find those scraps and enjoy! You will need some kind of saw to cut the wood to size. For plywood it could be a table saw or circular saw (use a guide track to make accurate cuts). 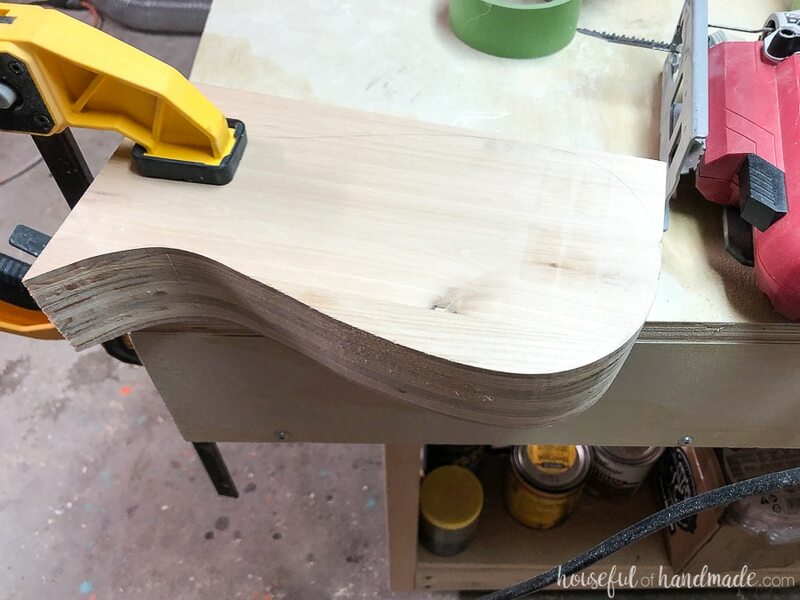 If using boards, a miter saw would work (I still use this inexpensive miter saw). 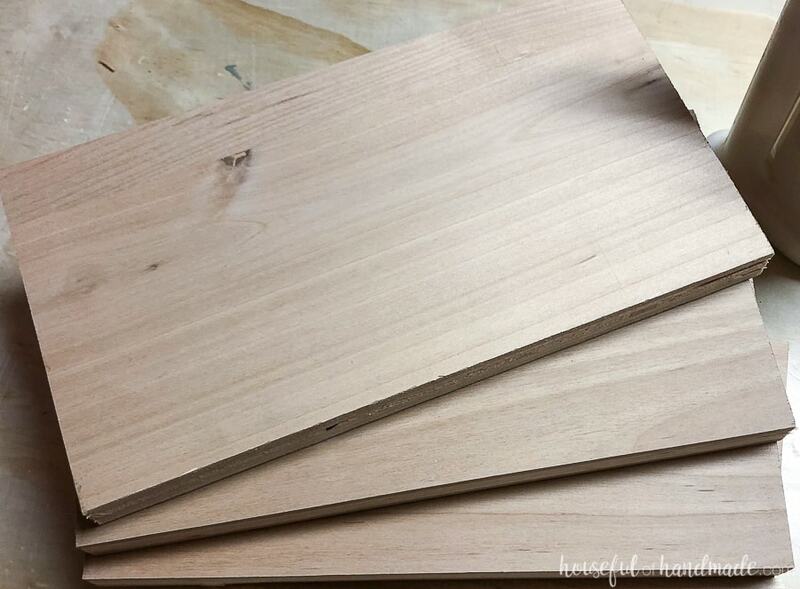 If you don’t have scraps of plywood, you could also use (3) 10″ long pieces of 1×6 boards (which are 5 1/2″ wide). 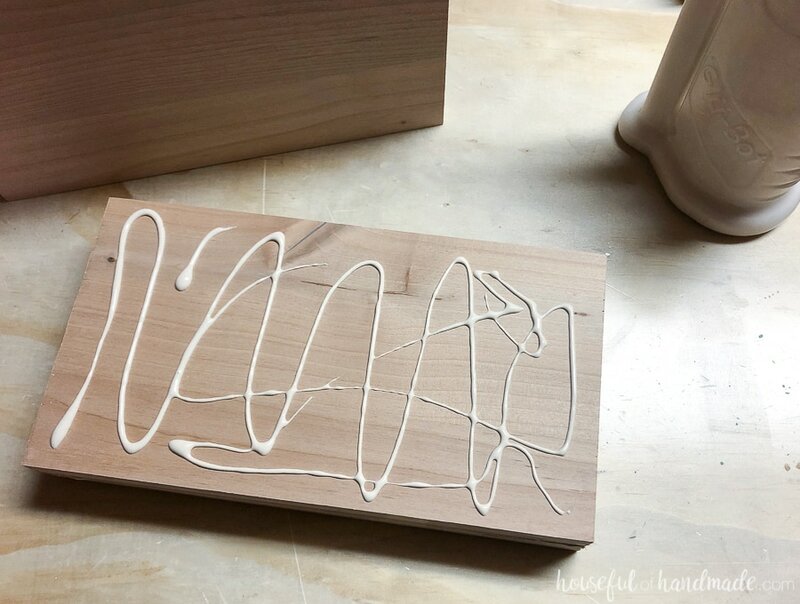 Or make your own wipe-on poly by mixing 1 part polyurethane (not water based) with 2 parts odorless mineral spirits (this is my new favorite finish, I used it on my dining room hutch and wall jewelry organizer). 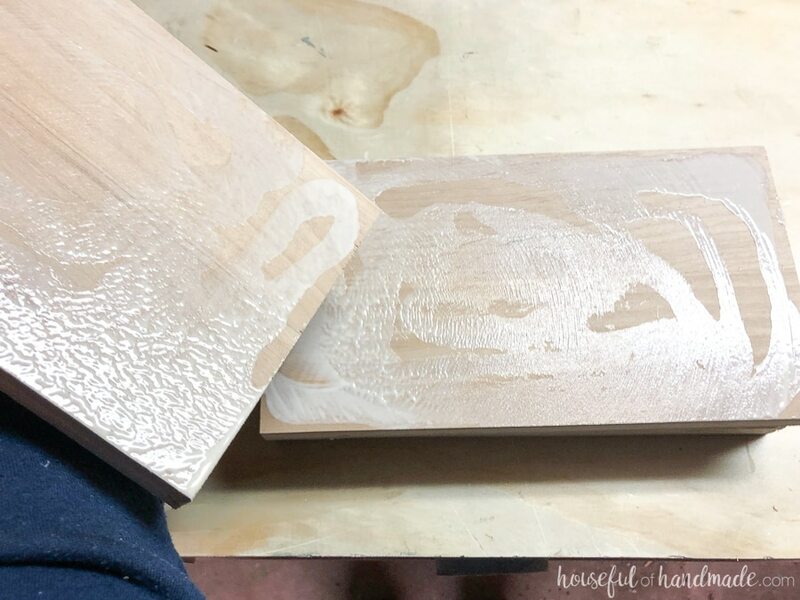 Cut your 3/4″ plywood scraps to size. You will need 3 pieces that are 10″ tall x 5 1/2″ wide. 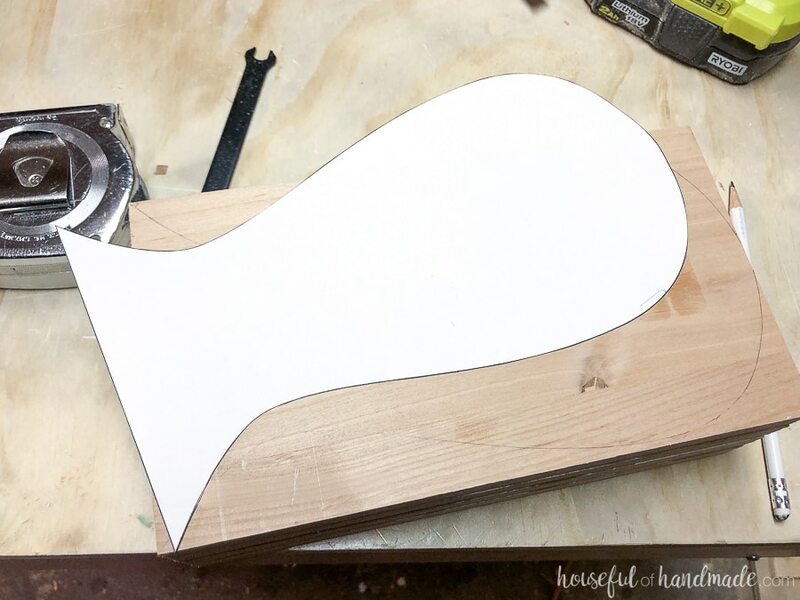 You could also use 1/2″ plywood scraps, just cut 4 of them. Or you could use 1×6 scraps too. 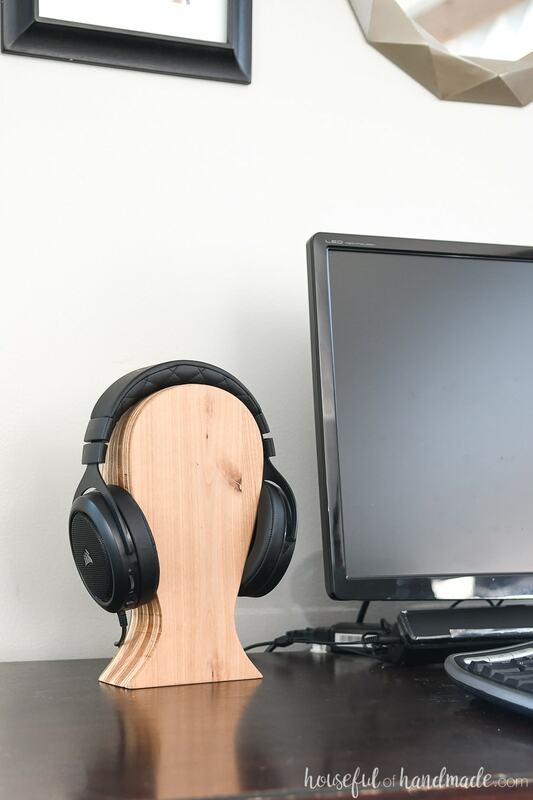 That would give the DIY headphone stand a solid wood appearance. But I like the stripes on the side from the plywood, and happened to have plenty of plywood scraps that needed to be used up. 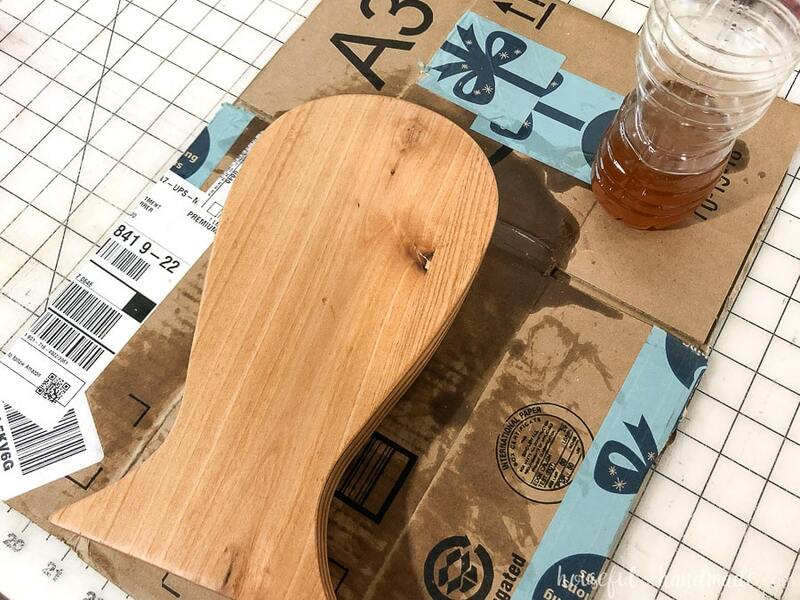 Using the wood glue, glue the 3 pieces of wood together to create a large block. Add a hefty amount of glue all over the top of one piece. P.S I love the GluBot and use it in my shop daily! Then place the next piece on top of it. Move it around in circular motions to spread out any glue. Repeat for the 3rd piece. The pieces of wood will slide around a bit as you get the glue in between them. That is okay, it means you have enough glue! Once the three pieces are together with the glue between, line them up. I focused on making sure that just the bottom of the boards was perfectly aligned. This is the only side that will not be cut again. The other three will be shaped by the jigsaw so don’t stress too much about getting them perfectly aligned. Then clamp the three boards together. 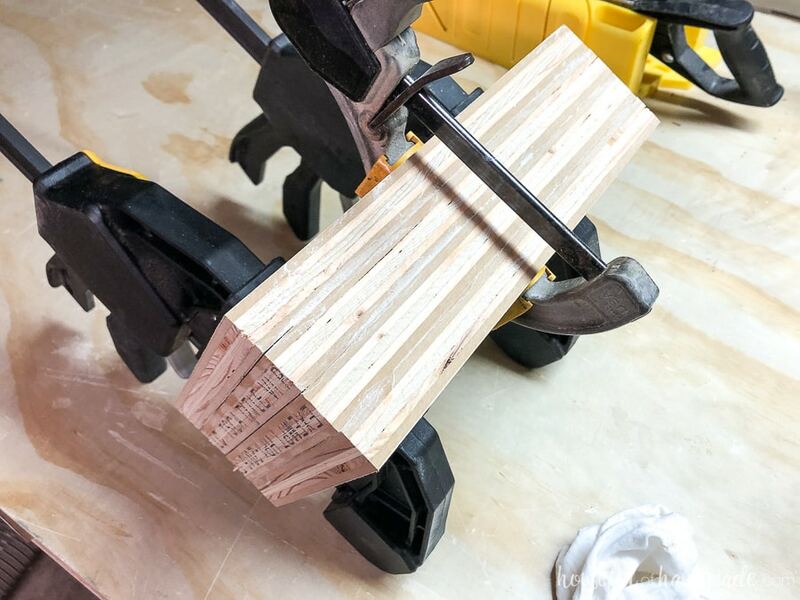 I used 3 bar clamps. Two on one side and then the 3rd on the top to make sure the clamping on the one side didn’t make the other side fan out a little bit. In the photo above you may see that my original headphone stand was made with 4 pieces of 3/4″ plywood. I thought I wanted it thicker. But then it was too thick for the jigsaw to cut through. I just forgot to take photos of the 3 pieces clamped together. And the 3 pieces of plywood actually make it the perfect thickness to cradle the headphones. After the glue is dry, print and cut out the headphone stand template. Then trace it on your block of wood. Make sure the bottom of the drawing is on the bottom of the block that you made sure was nice and flush. Using a jigsaw with a long blade, made for wood (I used this Ugly jigsaw blade by Skil), carefully cut around the design. Because the wood is so thick, it will take a bit of time so go slow and let the jigsaw cut it’s way through. Focus on keeping the the blade straight by keeping the base plate of the jigsaw flat with the top of the wood. 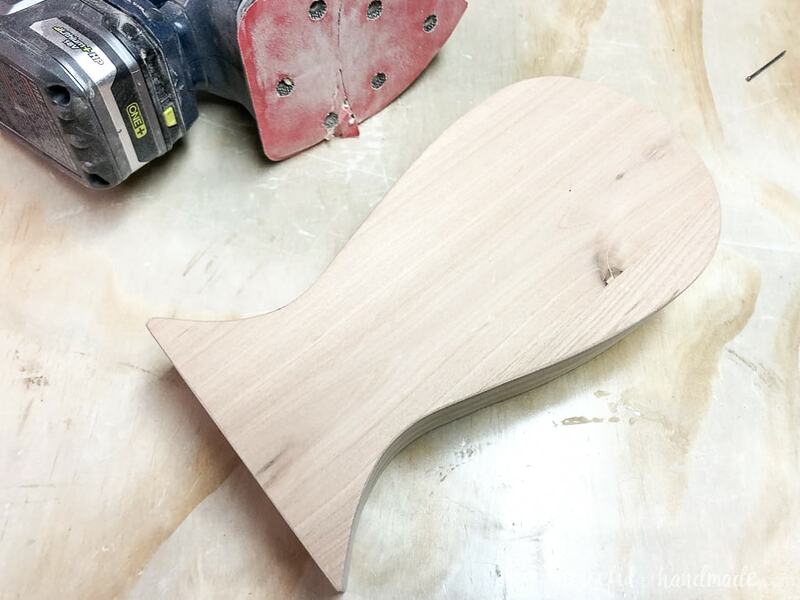 Once the stand is cut out, smooth out the sides with sandpaper. I used 22o grit sandpaper and a corner cat sander. This allowed me to get into the curves easier. If your sides are not very smooth after cutting, start with a lower grit sandpaper and then finish with the 220. 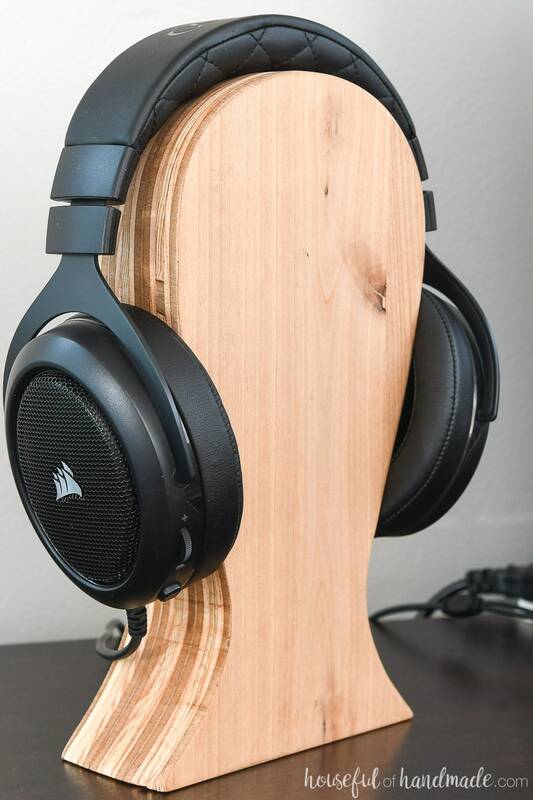 Paint/stain/seal your headphone stand however you want. I love the color of the alder plywood and the stripes on the side, so I chose to just seal it. I used a homemade wipe-on polyurethane. You can easily make your own by adding 1 part polyurethane (it cannot be the new water-based polyurethane) and 2 parts odorless mineral spirits to a disposable container. Shake well them apply liberally with a cloth. The tip-on poly soaks into the wood because it is thinned out with the mineral spirits. It also doesn’t create a super shiny, sitting on top of the wood, finish like traditional polyurethane. Let the finish dry completely, then test it out with the headphones. 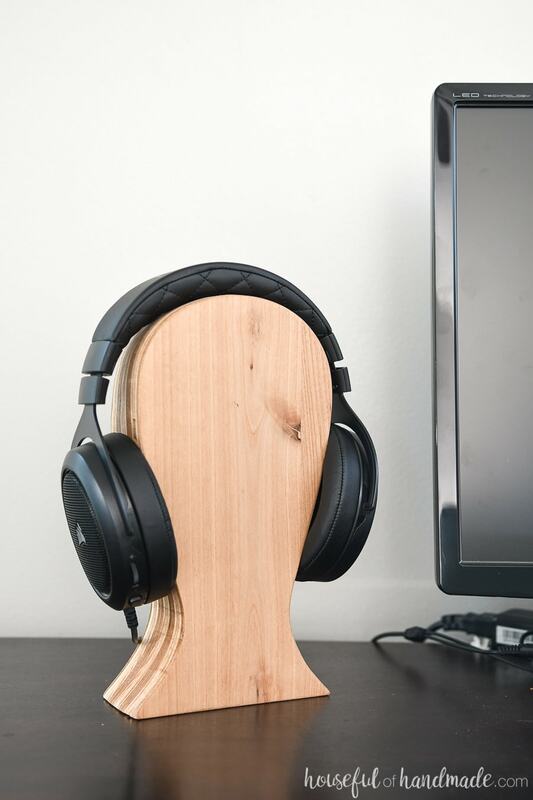 The thick wood base stands sturdy and holds the headphones nicely. And I think it looks quite awesome on his desk. 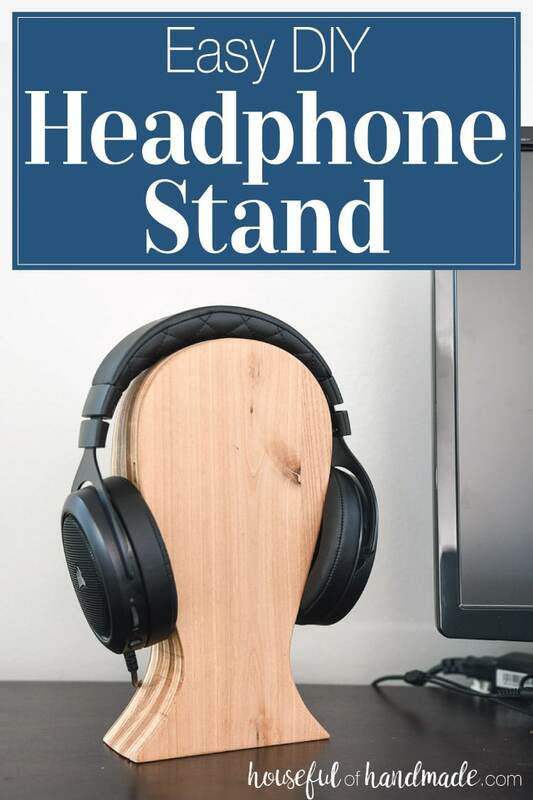 Way better than some of the other boring headphone stand options. And I cannot get over how easy it was to make with scraps in the garage. Zero dollar gift for the win!